TriviaMatic vs Pub Quiz - TriviaMatic! The ‘Pub Quiz’, otherwise known as a ‘Trivia Night’, is an essential part of western culture with roots dating back as far as the middle ages in Britain. In the 1970s, pub games with names such as Ringing the Bull and Dwile Flonking (a game which involves throwing a beer soaked cloth at opponents whilst they dance in a circle) became replaced by the infamous ‘Pub Quiz’. During the 1970s Sharon Burns and Tom Porter started to serve UK breweries with pre-written quizzes, the results of which were then entered into a UK-wide leader board, allowing competition across different establishments. This move was genius as it promoted widespread gaming during quiet times of the week (where usually drinking establishments would be close to empty), increasing pub revenue as well as creating local centers of activity in towns and villages across the UK. When Burns and Porter first set up, the sales pitch was correctly focused on amplifying alcohol revenue through enticing a greater number of punters into the pubs. Today pub quizzes are an ingrained part of British Culture; a recent estimate suggested that 22,445 events are held each week. In the US they are less commonplace, but with trivia games on the rise, the trend is set to increase. With the advent of phone technology, some complain that the use of mobile phones has lessened the integrity of the game with contestants texting friends to ask for help when they don’t know the answers. 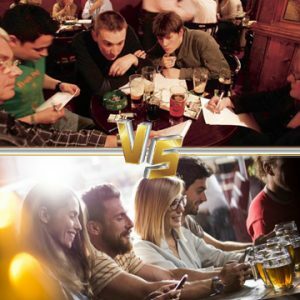 However in recent years, the illegality of phone usage has been counteracted by trivia nights being solely conducted on mobile phones – demonstrated by the popular rise of trivia apps appearing on the market. Such apps mean that pub quizzes and trivia nights are conducted via advanced app technology which has huge advantages over traditional play. The gameplay is guaranteed to be better, faster and most importantly, the app eliminates cheating through time-restricted, multiple-choice rounds. One such app, TriviaMatic uses a three-tiered approach. Hosts, advertisers and participants are all likely to benefit from TriviaMatic’s technology. An automated game system means that set up is simple; by using the app in host mode, any pub or bar manager can instantly become the trivia night host, meaning that no extra staff costs are incurred. Through advanced app technology, businesses will be able to choose topics based on their target audience, leading to happier, recurring customers resulting in further profitability. The in-app advertising system also allows for targeted advertisements throughout the game directly aimed at trivia participants. In turn, when licensing allows, venues such as pubs or sports bars will benefit from an increased profit of drinks sales through real-time advertising. The app will also advertise future events to previous participants, meaning that a continuous flow of future customers is guaranteed. For participants, the ability to set up trivia nights wherever they live is a bonus, creating connections and social events. A wide selection of topics, from sports rounds to trending music, means that it will appeal to a large audience of pub-quizzers. The app is easy to use, and with social media interaction the game becomes more than just a quiz – it becomes a social event.